As I type this, Donald Trump is in the midst of a ceremony which will promote him to the de facto leader of the free world. That the former host of The Apprentice, and a businessman who has been rendered bankrupt multiple times, has achieved such heights is remarkable. That his campaign was largely centred on white ethno-nationalism and post-modern, ironic meme culture makes the whole thing even more incredible and almost impossible to believe. Yet, to look around the world, at the pop culture we consume, or the ideas we ingest, is to see a people who have begun to communicate and feel almost exclusively from behind protective blankets of irony. Our favourite films are "so bad they're good" and the songs we profess to enjoy are "guilty pleasures". Hardly anyone has the inclination to say how they feel without masking it in some way. To return to the politics which opened this piece, very few people will have the courage to announce they're scared the economy will leave them behind culturally and fiscally - posting multiple images of Pepe on Twitter, Reddit and 4Chan, however, allows these people some means of voicing their displeasure without showing their hearts or minds to anyone. Irony has won the war; earnesty is dead or dying. La La Land, I'm pleased to note, bucks this trend admirably. I've previously written, with great exasperation and on multiple occasions, of how many modern movies fail to inspire their audiences to dream - real emotion is supplanted with manufactured kookiness (see Little Miss Sunshine as a prime example), and we're seldom asked to connect with a movie in any circumstances beyond the Pavlovian. Pleasingly, then, Damien Chazelle's movie introduces us to the story of two young souls who aim at detaching themselves from detachment. Mia (Emma Stone), is a barrister who dreams of the bright lights of Hollywood - a childhood enchantment with Casablanca and the Golden Age greats encouraged her to drop out of college and to follow her heart to Tinseltown. Her many auditions fail to amount to much but once a fire has been lit, hope is the fuel which keeps the embers of her passion aglow. 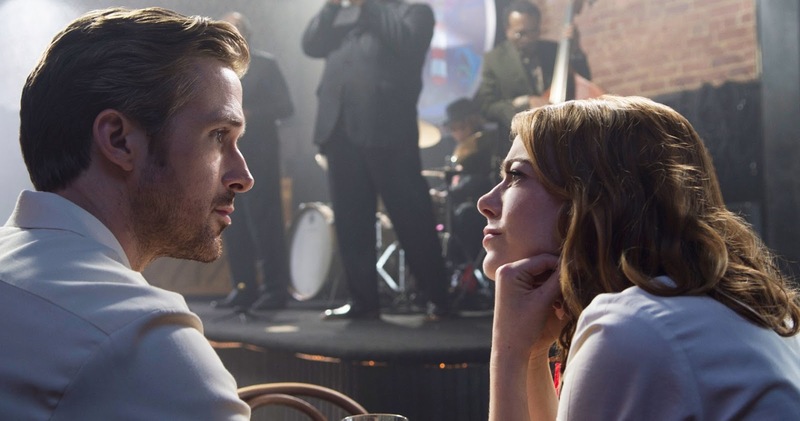 Meanwhile, Sebastian (Ryan Gosling), is inspired by nothing more in life than becoming lost in music. As he watches musicians swoon in synergy, entwining melodies and rhythms in free-floowing jazz, he speaks vividly and passionately about the art-form; music, we remember, is important. He yearns, above all else, for proprietorship of a legendary jazz-club (one which currently revels as a samba-tapas bar) in which he'll be able to intoxicate patrons with the organic and pure alchemy of live, improvised splendour. As is to be expected, Mia and Sebastain's paths cross and the pair, each immensely delighted by one another, act to propel the other forward. Dreams, we see, often become bigger and more vivid when we have another heart to share them with - Mia's plans for the future, a wild flight of fancy which took their modest roots on the black and white pages of scribbled plays written as a child, suddenly burst into glorious Technicolour before her eyes. Life feels like a musical when you're in love - and Chazelle communicates this perfectly in his immense and honest tribute to following one's desires wherever they may lead. We won't know if the path ahead of us will lead us to where we want to go unless we dare tread it. 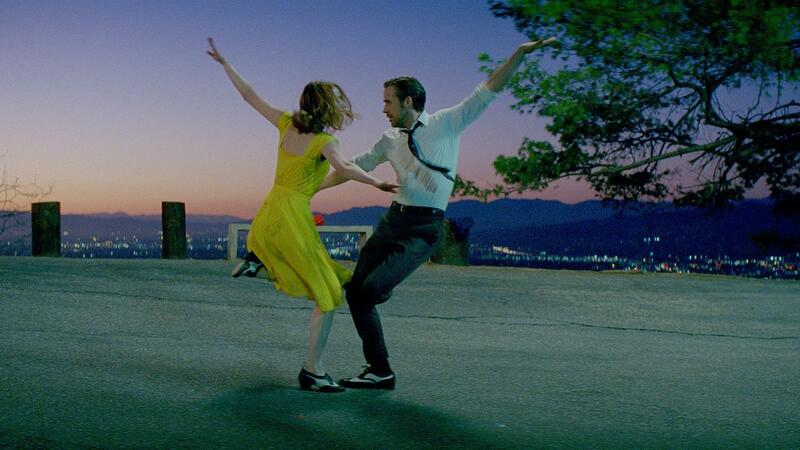 After clearing up at the Golden Globes, it is easy to see why La La Land has become the toast of the film industry. This is a movie which excels in every single category imaginable - its a technical marvel full of meticulous choreography, the costume design is second to none and the cinematography captures what the world looks like when we open our eyes to optimism. Gosling and Stone, a certainly not aesthetically displeasing duo, are charm personified and Chazelle, who I suspect above all else must be a musician as well as a film-maker, directs the movie with bravura flourishes complimenting metronomic pacing. This is a movie which shows what can happen when you wear your heart on your sleeve, when you feel you don't have to hide any more. Life can be a song and dance - and when you share an earnest melody with someone who understands, suddenly there are two people alive with the contagious joy of music. And, in a world of irony and jaded cynicism, there's few things worth celebrating more.